One thing you don't want to do with most knives, whether they're fixed blades or folders, is use them for throwing practice. Anything breakable on the knife quickly breaks. That ranges from part of the blade to all of the blade to any part of the handle. Unless you're an expert and land the knife on point every time, you're just causing problems. Throwing knives often compensate for this unavoidable abuse with light weight and cheap steel. Low temper allows throwing knives to bend rather than break, but the result feels and cuts like a toy knife. Cold Steel went the other direction with the Perfect Balance Thrower, adding weight in the form of tempered high carbon 1055 steel. The steel stock in this fixed blade is exceptional thick -- the 13-1/2-inch-long knife weighs almost a pound. The point of balance is perfectly centered for proper rotation in the throw, and the point of the knife is shaped to hold up to the stresses of impacts. 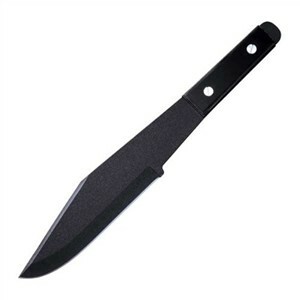 Slender handle scales of strong composite give the knife just a little more than bare steel for a grip. Scales might be damaged by bad throws, but the flathead screw mountings make them easily replaceable by owners. Since the scales stop short of the knife's heel, there's some protection from reversed impacts. The Perfect Balance Thrower could be a good survival Bowie if you like knives that work like an axe, but the knife stock is too thick for delicate cutting jobs. Think of it as a chopper, not a skinner. Cold Steel makes a belt sheath for the Perfect Balance Thrower, but the sheath doesn't come with the knife. See the Boker Competition Throwing Knife for a professional version of the throwing dagger.